Year of the Boar! - Super Inky! Happy Lunar New Year! This year is the Japanese Year of the Boar / Chinese Year of the Pig. Many cultures in Asia celebrate the Lunar New Year and some of the traditions are similar and some are different. My friend Zoya Yumiko has Japanese heritage, so she came over to celebrate the holiday with me. We set out lots of treats and little figurines to celebrate the day. 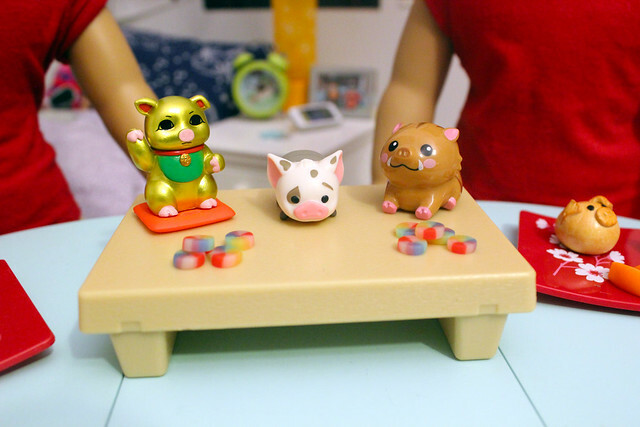 Zoya Yumiko's family sets out kagami mochi (stacked mochi) decorated with little figurines of tangerines and boars and a knot of gold and red ribbon. The tangerines, or daidai, represent the continuity of generations. The little boar represents this year's zodiac animal. 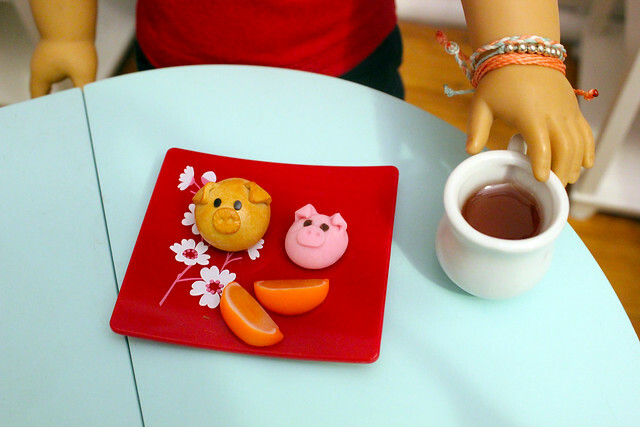 After her family celebrated, Zoya Yumiko brought me the little boar on the right. Isn't it cute? She also brought over a lucky pig, which waves its arm to welcome prosperity. Not to be outdone, I contributed my little Pua the pig figurine to our display. He is from the movie Moana! Zoya Yumiko also brought little yuzu candies in the shape of rainbow wheels. Yum! They're very refreshing. Zoya's family makes the best New Year treats! She brought us piggy buns, piggy-shaped strawberry mochi, and fresh tangerines! We also had tea, or ocha. Zoya Yumiko and I had fun trying all the different treats, both sweet and savory. 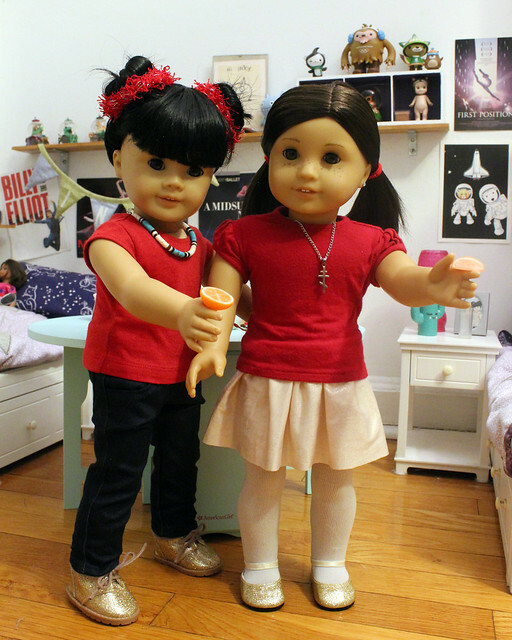 We both wore red and gold clothing to celebrate the Lunar New Year, because they are considered to be among the most beautiful colors. We celebrated and ate until we were so full. Even though New York City gives kids the day off from school for Lunar New Year, Zoya does have school tomorrow, so she couldn't stay over too late into the evening. Before she left, she gave me otoshidama, or a red envelope gift of money, from her parents. Zoya told me that it's common to have all kinds of fun designs on these envelopes. The one from her family is shaped like a daruma Hello Kitty! Daruma are little round doll figures that represent the founder of Japanese Zen Buddhism. I hope you enjoyed learning about Japanese New Year customs with me and Zoya Yumiko! P.S. 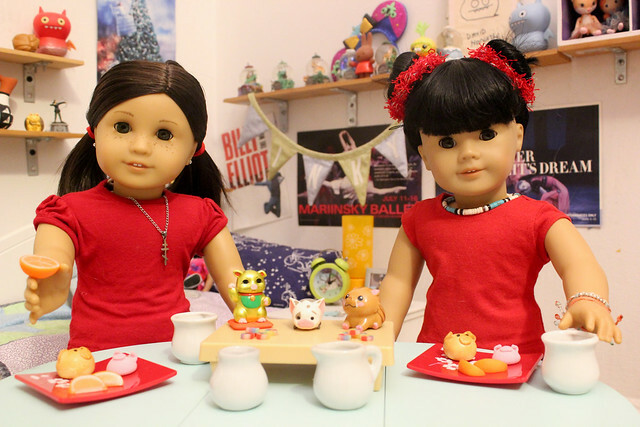 Would your dolls like some New Year treats of their own? Check out Faux Real Food's etsy shop for piggy buns, mochi, and yuzu candies, among other treats.